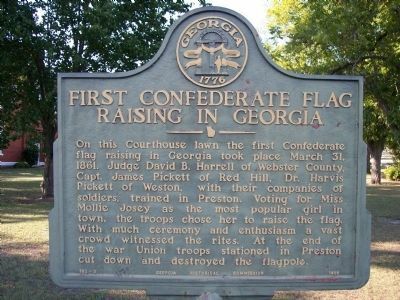 On this Sunday, the first Confederate flag is raised in Georgia, on the courthouse lawn in the town of Preston. Judge David B. Harrell of Webster County, Capt. James Pickett of Red Hill, Dr. Harvis Pickett of Weston, with their companies of soldiers, trained in Preston. Voting for Miss Mollie Josey as the most popular girl in town, the troops chose her to raise the flag. With much ceremony and enthusiasm a vast crowd witnessed the rites. At the end of the war Union troops stationed in Preston cut down and destroyed the flagpole. When the First National flag reached Preston it was raised proudly on a 60ft flagpole receiving cheers and applause from the soldiers and the families. The soldiers then marched north of town to Shiloh-Marion Baptist Church and ate barbeque, enjoyed fellowship and some were baptized in a pool which is still there. Then they marched off to serve their Southern Country.